You are here: Home / Entertainment / Goosebumps 2 Now Available on DVD & Blu-ray! If you were a lover of the Goosebumps book series growing up like I was, then you will be excited that Goosebumps 2 is now officially out on DVD & Blu-ray! There are some great bonus features available, as well! Find out more below! Slappy the devious ventrioloquist dummy returns to run amuck, in this second installment of the family-friendly franchise based on R.L. Stine’s beloved book series. Standing in Slappy’s way is a terrifyingly talented cast including Wendi McLendon-Covey (The Goldbergs), Madison Iseman (Jumanji: Welcome to the Jungle), Jeremy Ray Taylor (It), Caleel Harris (Castle Rock), and Chris Parnell (Rick and Morty), with Ken Jeong (Crazy Rich Asians). 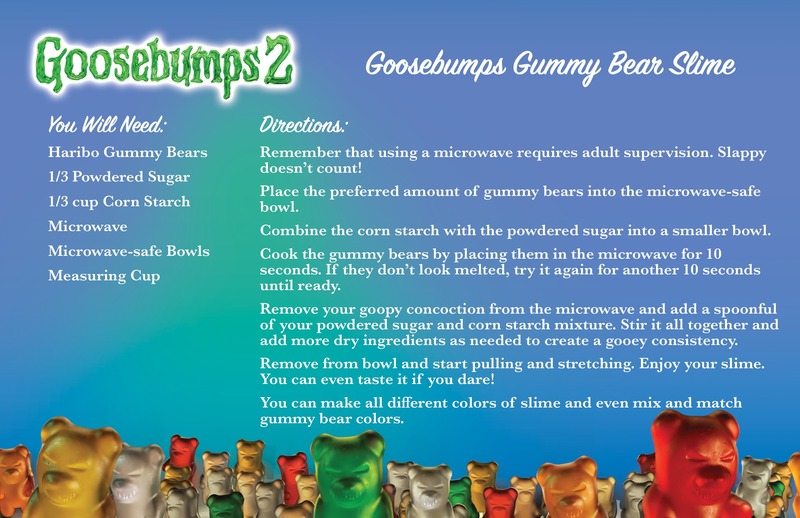 Make it an ultra-fun family movie night with this Goosebumps Gummy Bear Slime recipe! Enter to win your own copy of Goosebumps 2 on DVD right now! To enter, simply use the Rafflecopter form below. This giveaway ends January 26, 2019 at 12am EST! Good luck! Oh yeah, I read so many of them growing up! “Have you read any of R.L. Stine’s Goosebumps books?” I haven’t, but I’ve seen all of the TV series episodes and the first movie! I haven’t read any of the Goosebumps books. I’ve read so many of those books! We have a whole shelf full they are my daughter’s favorite! My sons have read a bunch of them. I think I read one years ago..! No I haven’t, but my son has. I have not read any but my kids did. Goosebumps was some of my favorite books growing up and my son loves them now! Neither my son or I have read any yet. No I have not read any of the Goosebumps books but my niece loves them. I read so many of the them as a kid! I have not read any of the Goosebumps books all the way through but I have read bits and pieces with my kiddos when they read them. I have seen the movies and I love them! I have not read any of his books but my son has read some of them.